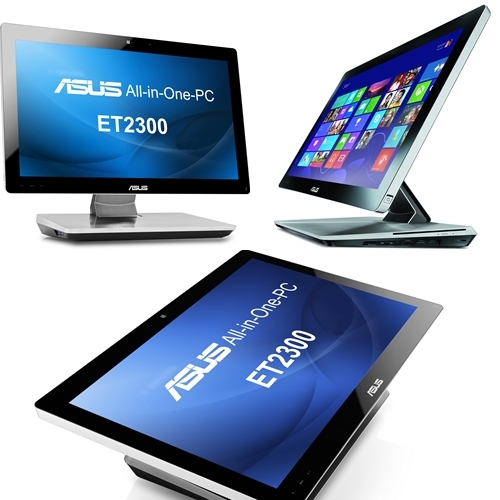 Let me share to you one of the latest Windows 8-ready All-in-One PCs from ASUS, the ET2300 All-in-One PC Series — a fully-fledged desktop PC with a 23” multi-touch display. The ET2300 has a unique double-hinge design that allows it to be used both as a traditional desktop with an upright display and as a digital canvas that folds flat parallel to the table top. It is the first All-in-One PC with a built-in array speaker and subwoofer, an external subwoofer, and ASUS SonicMaster technology — these enable the ET2300 to deliver incredible acoustic fidelity unheard from other PCs. In addition, Intel® Thunderbolt™, Intel® Wireless Display (WiDi), and USB 3.0 provide flexible and future-proof connectivity. For more details, please refer to the press release below. 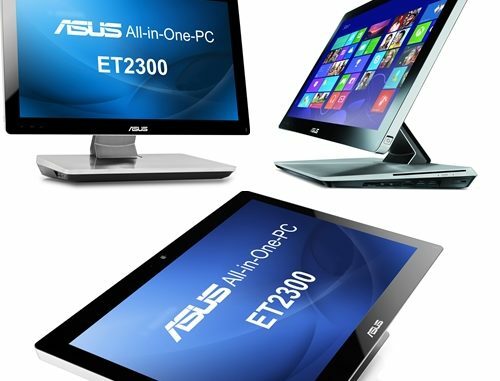 Manila, Philippines (23 October, 2012) — ASUS today announces the ET2300 All-in-One PC Series — a fully-fledged desktop PC with a 23” multi-touch display. With Intel® i7 desktop processors, lifelike audio and user ergonomics all incorporated in its sleek and neat design, the ET2300 is perfect for productivity and home entertainment. The ET2300 has a unique double-hinge design that allows it to be used both as a traditional desktop with an upright display and as a digital canvas that folds flat parallel to the table top. It is the first All-in-One PC with a built-in array speaker and subwoofer, an external subwoofer, andASUS SonicMaster technology — these enable the ET2300 to deliver incredible acoustic fidelity unheard from other PCs. In addition, Intel® Thunderbolt™, Intel® Wireless Display (WiDi), and USB 3.0 provide flexible and future-proof connectivity. The ASUS ET2300 is powered by the 3rd generation Intel® Core™ i7 desktop processor with discrete NVIDIA® GT630M (1GB/2GB) or Intel® HD 2500/4000 graphics for impressive performance. WiDi makes it easy to enjoy audio, video and photos with family and friends through seamless wireless streaming to WiDi-enabled HDTVs. Two Intel® Thunderbolt™ and four USB 3.0 ports provide ultra-fast data transfer speeds and flexible expansion options, while HDMI input turns the ET2300 into an HD display for game consoles and Blu-ray players. The ASUS ET2300 has an innovative double-hinge design that allows it to fold flat parallel to the table top for easy and intuitive use of Windows 8 apps on its 10-point multi-touch 23” display. A 178° wide-view angle IPS display ensures clear and vibrant images, making the ET2300 an ideal shared entertainment platform for all family members. The ASUS ET2300 is the first All-in-One PC to use an array speaker and an internal subwoofer to deliver an expanded soundstage with immersive, cinematic surround sound. Developed by the ASUS Golden Ear team of audio experts, SonicMaster technology further refines sound quality for a wide frequency range that reproduces every acoustic detail. In addition, the external subwoofer extends bass response by a full octave. ASUS desktops reflect a tradition of the finest product quality, innovation, and longevity. Based on PCWorld USA’s 2011 Reliability and Service Survey, users ranked ASUS as the leading choice for Windows-based desktops, citing high satisfaction due to reliability, value, and quiet operation. ASUS desktops received further praise for performance, design, and connectivity. The ASUS ET2300 All-in-One desktop PC will be made available with an SRP of PhP49,600 with an Intel Core i5-3330 (6M Cache, 3.0 GHz, Turbo Boost up to 3.2GHz) and Microsoft Windows 8 OS pre-installed. ASUS also offer a 3-year warranty with on-site service. What Is A Mag Drive Gear Pump? Which Energy Analyzer Is Right For You? John on Pacquiao vs De la Hoya FREE streaming! John on ‘Geniusphones’ LG Optimus 2x and Optimus Black have arrived!